Alfredo (Porel) and Antonio (Lovelock) are cops and partners assigned the tough jobs in Rome. Their captain, known simply as “The Captain” (Celi) is caught in a bind: he knows about their reckless and violent ways, but he can’t deny they get results. So he tolerates them, as does Norma (Dionisio), The Captain’s secretary. So he designates the two men as a “special squad”, which allows them pretty much free reign in Rome, which means not just legal rules, but perhaps even moral ones are broken. The rest of the movie is almost like a series of vignettes as they go to different crime scenes and solve the problem in their own inimitable no-mercy, no-prisoners, no-conscience, no-problem style. These situations range from a hostage showdown to an illegal gambling ring, and beyond. It all comes to a head as our two anti-heroes finally confront a crime boss named Pasquini (Salvatori) on his yacht. Will living this type of lifestyle finally catch up to Alfredo and Antonio? Find out today! 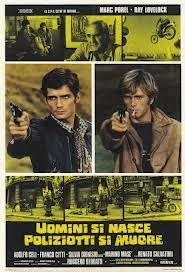 Here we have noted director Ruggero Deodato’s entry in the Poliziotteschi sweepstakes of the day. So you’d have to figure Mr. Cannibal Holocaust (1980) himself would turn in a particularly hard, violent, brutal and uncompromising entry. And you’d be right. There is certainly a strain of nihilism that runs through Live Like A Cop, Die Like A Man, and it’s not to everyone’s taste. Especially since the tone of the movie and the actions of the characters are so alien and unfamiliar to American audiences of today. We’re so unused to seeing behavior like this on screen, it’s hard to know what to think. While no doubt an acquired taste, Deodato was simply reflecting what was going on in Italy at the time and, presumably, his rage about the conditions in society then, especially as it relates to crime. 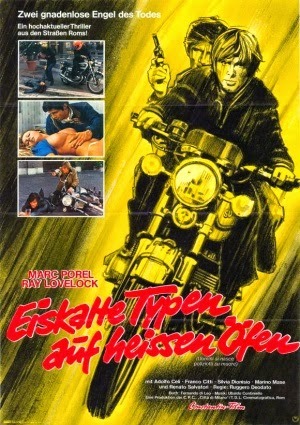 Moral considerations aside, there’s plenty for genre fans to enjoy here, such as the insane motorcycle setpiece at the beginning of the film (which provides a killer kickoff to all that we‘re about to see - letting viewers know this is no run of the mill crime drama), as well as other well-staged and well-shot violent moments. From the title on down, you know that you’re in macho territory here. While it may be in dispute whether that’s Deodato subtly mocking (Italian?) machismo, or he’s legitimately going for it, the movie delivers the goods nonetheless, from start to finish. Ray Lovelock himself sings the Bob Dylan-like songs on the soundtrack, and the movie works on at least two levels: as a comment on the society of the time and the behavior of men, or simply as a violent actioner. It doesn’t take much to read into the movie just a tad, and the fact that you never really root for and get totally behind Alfredo and Antonio is most likely not an accident. It’s probably more an indicator that there may be more brewing beneath the surface. 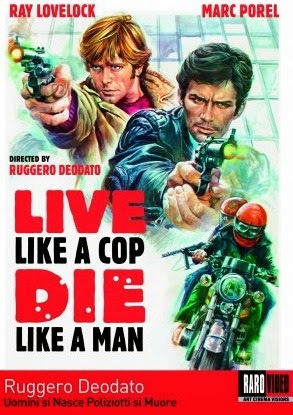 Released on DVD by Raro, Live Like A Cop, Die Like A Man may not be for everyone, but viewers will see a movie ahead of its time, and a Poliziotteschi that will make you think. We recommend it. I love it as a violent actioner. But it is also a look at society in Italy during the 70's. Mafia, Crime and the vision of police which became master over the crime. Interesting body language between the lead pairing of Lovelock and Porel during the opening sequence. Seems like a deliberate attempt to steal the limelight from each other as one leans with the motion of the motorcycle the other moves to obscure the other. I have heard it suggested that the pair did not get along. Harry: Yes, it does work on at least two levels. Nigel: Interesting gossip about the relationship between the two actors. It certainly seems possible.